Optical fiber based CAN router for the connection of SafetyBUS p subnetworks. Two connector modules are available. SafetyBUS p fiberoptic router SBR-FL1000/CMD range up to 1km and SafetyBUS p fiberoptic router SBR-FL4000/CMD range up to 4km. 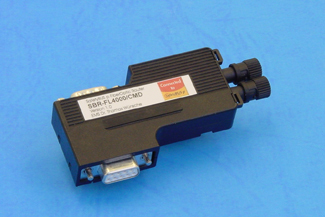 The router SBR-FL/CMD transmits data between SafetyBUS p networks using optical fiber. Extensions up to 4km are possible depending on the version of the product. SBR-FL/CMD includes a CAN interface that supports 11-Bit CAN identifiers as well as a 32-bit microcontroller of type LPC2119 with 128kByte Flash and 16kByte RAM. SBR-FL/CMD automatically detects the baud rate on the controlling side. The I/O side can be run with the baud rate detected on the controlling side or an independently customized baud rate. CG FL has a male and a female D-Sub-9 connector to attach both SafetyBUS p and power supply. The optical fibre is connected by a pair of ST plugs and intended for use with multimode fibers. Any (also temporary) stress in excess of the limiting values may cause permanent damage on SBR FL and other connected devices. Exposure to limiting conditions for extended periods may affect the reliability and shorten the life cycle of the device. vice. All values, unless otherwise specified, refer to a supply voltage of 5V (SBR FL) and an environmental temperature of 20°C. Fibre length specifications are valid for fibre damping of 3dB/km without additional patch panels.